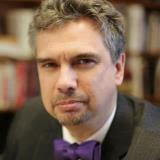 Miguel De La Torre, Professor of Social Ethics and Latinx Studies at the Iliff School of Theology in Denver and a liberal-minded ordained Southern Baptist minister, is the editor of the forthcoming collection of essays, Faith and Resistance in the Age of Trump, due out in September from Orbis Books. De La Torre says a silver lining of Trump’s election is that the Church might be saved from irrelevancy. “For many people of faith, the election of Donald Trump represents not just a political crisis—a threat to our republic and a danger for the entire world—but also a confessional crisis, a moment that calls into question the deepest meaning of our religious claims and values. “Reflections by notable religious scholars, ministers, and activists address this crisis. With chapters treating issues of gender, race, disability, LGBT justice, immigration, the environment, peace, and poverty, the contributors seek to name our situation and to set forth an agenda for faith and resistance.